The big international 12 December Day of Action on Climate Change started at Christiansborg Slotsplads (Parliament Square) with estimates of 100,000 people on the streets. The group marched across the city to the Bella Centre, where international UNFCCC negotiators have been holed up over the past week debating texts that some in civil society consider meaningless – or dangerous. On Sunday, the Hit the Production at the Harbour action ended with mass preemptive arrests of 257 people. Also on Sunday morning, Via Campesina held a rally and march with street theatre and samba. It was dispersed by local police. The march then moved to the Klimaforum but the police blocked access, and it then ended near the Råhuset infopoint. It was hugely successful despite the police attempts to disrupt it. Via Campesina protesters focused on agriculture and the impacts of climate change on farmers. 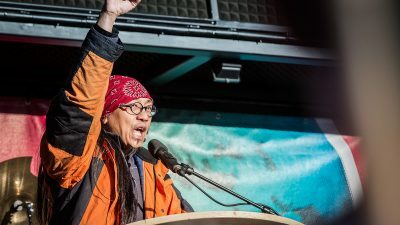 Luis Henrique Moura from Movimento dos Trabalhadores Rurais Sem Terra (MST, Landless Worker’s Movement), Brazil, is in Copenhagen to protest against the false solutions to climate change. We spent some time chatting to him. What are the links between agriculture and climate change? In Brazil we have primarily two ways of seeing this – and this is what the campesinas feel. We have floods, which we did not have before, and a lot of droughts. We have cyclones, and our country has never seen cyclones before. This is all affecting how we produce food. The other thing that we are concerned about is the advancement of the false solutions. We have several campesinas being expelled from their lands in Brazil because of offset projects for creating parks for REDD (Reduced Deforestation and forest Degradation) projects. In Brazil we see these REDD-type projects as green capitalism. What is the Via Campesina position on REDD? There are projects of REDD in Brazil, Peru and countries in Africa. We know this because of other movements in Via Campesina that are denouncing these projects. In Brazil, for example, we have big projects in partnership with latifundiaros (large land holders). These latifundiarios produce soya and sugar cane on large extensions of land. They have their own protected forest zones and there is no discussion about agrarian reform. Another big issue is the sugar cane expansion for ethanol production. In Brazil we have families who cannot produce crops anymore. They are paid to produce only sugar cane, and they are expelled from the lands – or assassinated. The position of Via Campesina is that we cannot have market-based solutions, and not even the creation of funds, because every fund increases corruption in our country. We have to see a system change in rich countries, and in the South we need to have agriculture based on campesina agriculture, and not based on industrial agriculture. What is the position of the Brazilian Government in the negotiations now? The Brazilian Government does not take the worst position – Brazil continues to reject market proposals and defends the idea of voluntary funds. The [Northern] countries would make donations for the creation of the REDD. We have a contrary position on REDD. The Brazilian position is not a valid one, it is a false solution. Now the Brazilian position has many problems regarding ethanol because ethanol in Brazil depends on the latifudio. We have a lot of slave labour and just last year 5,000 people were liberated from slave labour. There is degradation of the soil and water, and the Brazilian position also defends the forests, but these are really monocultures. There are big multinational companies like Stora Enso or in Brazil, Aracruz has capital from Norway and these multinational companies have REDD projects and the Brazilian position defends them. We see these problems in the Brazilian position. The Brazilian delegation is the biggest delegation in the conference, with 760 people, and the majority are from big companies such as the cellulose sector, ethanol, agribusiness and construction. What kinds of changes are needed in campesina agriculture to deal with the impacts of climate change? It is proven by many studies in many countries that campesina agriculture is better than industrial agriculture. We do not produce the same amount of soya by hectare because we produce many more crops, like mandioca (cassava), corn, beans. We produce food. The governments do not support campesina agriculture – on the contrary they support industrial agriculture. We need to have strength so that the demands from the social movements are heard. We need mainly to change the system – the actual system that produces sugar cane and corn to feed the cars in the rich countries, also the cars in our country. This system can never have campesina agriculture as a base. We need to change the entire system into a system that has peoples’ lives as a priority, whether they are in the countryside or city. What do you think is going to happen during the talks here? For us the COP 15 has nothing to do with discussions about climate or environment. The reality is that there is a clear discussion about continuing a capitalist market, and how it can be expanded into a market that we call green capitalism. They are discussing how to expand the markets of cellulose and how they can earn more money. REDD is discussing 50-60 billion US dollars per year for transnational cellulose corporations. How can we produce ethanol for agribusiness? But Brasil wants to expand production into Africa and East Timor. The COP 15 is a circus, a big international theatre that puts forward climate change as a theme, but in reality discusses nothing more than how to expand capitalism while taking advantage of the debates on climate change. Barring the controversy over whether all parties have conceded to the fate of a political declaration as the final agreement of COP15, the biggest dilemma now appears to be around the lack of consensus (or even convergence) on technical issues. Although the ‘shape and structure’ of this new outcome appears to be a vital sticking point, as Martin Khor of the South Centre points out, what remains may be considered a mere shell, the content for which is largely absent. Country positions: Some of this hollowness manifests in the wide disparity in emissions reductions targets that remains more than halfway through the conference. Australia and New Zealand appear most brazen, making statements about foregoing Kyoto altogether in favour of a new Protocol. The EU has also offered views largely in keeping with this. At the other end of the spectrum, new consensus positions seem to be emerging within several small island states, stemming from the Tuvalu proposal of 45 per cent cuts on 1990 levels from 2013 to 2017 and limiting global warming to 1.5o Celsius temperature increase. This also sees the retention of the Kyoto Protocol (KP) as an important legal instrument for addressing climate change. The opposite is tantamount to a failure of political will. The possibility of a ‘two-track’ outcome still features prominently, with Track 1 being an agreement for a second period of deep emissions cuts by developed countries (except the US) under the KP post-2012. Comparable emissions reductions will be made by non-signatories to the KP (the US, in other words), while developing countries would agree to take mitigation actions backed by finance and technology. The subjection of both developed and developing countries to measurable, reportable and verifiable reductions also remains in question. What is most substantially lacking from the processes to date is an analysis of failures within the KP, most significantly the market mechanisms, and ways to correct these without getting dragged into the one-track process that developed countries are edging towards. LAC – the devil lies in ‘lack’ of detail: The simplest way to describe the basic text proposed by the chair of the Ad Hoc Working Group on Long Term Cooperative Action (AWG-LCA) on 11 December is that it is vague and contradictory. The opening salvo of the section on shared vision, which should set overall emissions reduction goals, suggests that targets will be guided by ‘Best available scientific knowledge and supported by medium-term goals for emission reductions, taking into account historical responsibilities and an equitable share in the atmospheric space and supported by medium-term goals for emission reductions, taking into account historical responsibilities and an equitable share in the atmospheric space.’ But the text that appears thereafter provides a stunning impression of the indecisiveness on targets, with a possible range of 50 to 95 per cent reductions targets by 2050 (with these figures represented in brackets to signal a lack of agreement). 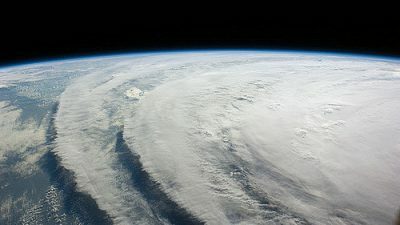 In the context of a two-year negotiations process, and almost halfway through the Copenhagen conference, this inconclusiveness show up the extent to which politics can trump scientific and moral imperatives. Perhaps most worrying is the continued vaguenesss on where emission reductions will be achieved. Domestic efforts are qualified by the term ‘primarily’, but no indication is given of actual figures. Even the ‘substantial deviation’ [in the order of 15-30 per cent] for developing countries belies more serious questioning of how baselines are being defined in growing economies. Some developing countries believe that the LCA text is becoming a more comprehensive document that serves to surreptitiously undermine the KP, so that the two will collapse at some point into one agreement. This may become more apparent as negotiations continue. AWG-KP- CDM: There are a large number of issues being discussed in this group, although discussion on the ditching of the KP itself lurks menacingly in the background. 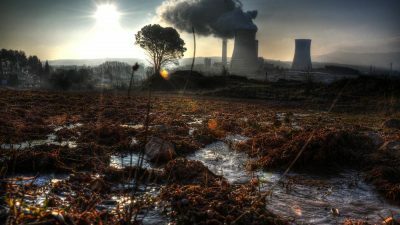 The most significant concerns relating to the Clean Development Mechanism (CDM) concern the scope of activities allowed within it, with discussions on whether to expand it to include nuclear power, carbon capture and storage, and sinks. The chair’s emphasis was on resolution of these at a political level – perhaps meaning when the high level delegations descend. The most emphatic statement of all came out of the CDM Contact group co-chair, Christina Figueres, who said that no party at the plenary suggested that the CDM be dumped. She stressed, specifically to observer organisations, that the message be taken home. The UNFCCC has informed observer organisations that access to the high level sessions will be limited, and that they will need passes to enter. Other ENGO groups will also want access to passes and these groups will need to decide on a process for distribution. Passes will likely be ready on Monday night for use from Tuesday. The number of cards are limited but they remain ‘blank’, so anyone from an organisation can technically use them. The restriction on access was given a dry run in Bangkok, presumably to work out kinks in a system that seeks tighter control over who comes in. Some civil society observers argue that this means that the more resourced you are, the better access you are allowed. The more political dimension side implies a desire to quell the ‘reclaim power’ emphasis of more grasrooots groups who insist on decisions being made ‘with us if they are about us’. The entry of high level delegations and the tightening of security to accompany this may also be a considered a motivation for this move.